Several car bombs have exploded across the Iraqi capital, Baghdad, killing at least 21 people and injuring scores more, officials say. The attacks are reported to have targeted mainly Shiite areas in the city. Security sources told the BBC three explosions rocked the neighbourhoods of Ourfally, Kiyara and Falah Street in the eastern suburb of Sadr City. Sunni insurgents linked to al-Qaeda have been blamed for a recent spike in violence. In Sunday’s attacks, bombs also went off in the suburbs of al-Amin, al-Husseiniya, Habibiya and Kamaliya, reports say. 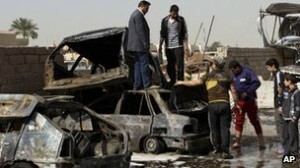 State-controlled al-Iraqiya TV said there were nine car bombs. Some detonated near busy outdoor markets. The nearby al-Sadr hospital was full of wounded people. Hussein Mohammed, who was wounded and saw his car destroyed in another blast, questioned how the bombers could get past security. No group has yet said it carried out the bombings. Some reports put the death toll as high as 37. Baghdad security officials said officers had defused another six potential car bombs, three of them in Sadr City. Although sectarian violence has decreased in Iraq since the height of the insurgency in 2006 and 2007, attacks are still common. Tensions have also been building up in the lead-up to parliamentary elections, due to be held in March. On Saturday, the head of Iraq’s intelligence academy, Ali Aouni, and two bodyguards died in a suicide blast in the northern town of Tal Afar. Gen Aouni is believed to be the second prominent Iraq figure to be murdered so far this year, after an opposition member of parliament was killed in the city of Falluja in the western province of Anbar. Earlier this month, at least 33 people died and about 100 were injured in a spate of car bombings in predominantly Shiite areas of Iraq. Thousands of Sunnis have held regular protest rallies in several cities since December, accusing the Shiite-dominated government of Prime Minister Nouri Maliki of monopolising power. 10 nation confederacy will be the anti-christ………. they will give their power and authority to the beast………. wound was healed. And all the world marveled and followed the beast. confederacy against You: 6 The tents of Edom and the Ishmaelites; Moab and the Hagrites; 7 Gebal, Ammon, and Amalek; Philistia with the inhabitants of Tyre; 8 Assyria also has joined with them; They have helped the children of Lot……………………………….